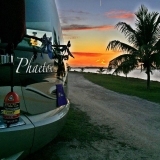 Can you reserve at Mayport / Pelican Roost RV Park for 30 days? I thought I remembered that the waterfront sites were only 14 days max? Thinking about non-waterfront for 30 if it's possible? Last edit: 3 years 6 months ago by Kokomo36. Reason: Clarification. You can reserve for 30 days at Osprey Cove that has long term parking behind the old housing area. At Pelican Roost only 14 days to start and then 2 or 3 days prior to your departure date you can ask them to put you on the list to move to another site for another 14 days if one is available. In the winter it is almost impossible to get the second 14 day request. We have been lucky twice to get a few more days by moving to the back rows but that was it.